I had to run an errand this afternoon that took me to my hometown of Midland, passing the new BBQ place. I could see the pit was fired up. It was necessary for me to stop, since I know no stranger, and I love all thing BBQ. 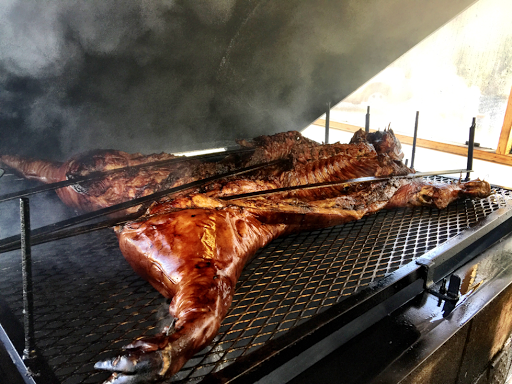 Jessie Jones was at the pit cooking a whole hog. He welcomed me like an old friend. We talked BBQ for the next 30 minutes while I breathed in the wonderful aromas. One never asks a pit master for a peek. The saying goes, "If you're looking, it ain't cooking", so I didn't consider asking for a peek. His pride took over and he offered a glimpse one he has ascertained my sincere enthusiasm for his craft.